In a major victory for the threatened southern California sea otter, in March of 2018, the Ninth Circuit Court of Appeals upheld the U.S. 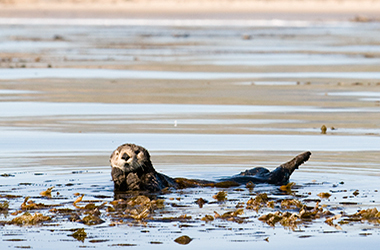 Fish and Wildlife Service’s (FWS) decision to terminate its failed “no otter” zone program offshore Southern California. FWS’ action was taken in response to a lawsuit brought by EDC and our client, The Otter Project, in 2009. The southern sea otter, the smallest marine mammal in North America, once populated the entire California coastline and extended into Baja, Mexico. Not only are sea otters intelligent and charismatic – using tools, entertaining us as they float around on their backs, and playing together as families – they are a keystone species that plays a critical role in protecting kelp forests and creating habitat for fish and other important marine life. Unfortunately, these creatures remain a threatened species since trappers in the early 20th century brought them to near extinction. In 1987, despite this dangerous status, the FWS finalized a rule designating all California waters from Point Conception to the Mexican border as a “no-otter” zone. This rule was intended to establish a second population of sea otters at San Nicolas Island, 60 miles off our coast. However, the fishing industry strongly opposed this plan (fearing a negative effect on abalone, urchin, and other shellfish), resulting in a compromise that allowed the reintroduction at San Nicolas, but also banned otters from all other waters in southern California. Recognizing the rule’s failure early on, with only 14 of the 140 otters who were transferred to the Island surviving there, the FWS quit relocating otters in 1991 but failed to finish a required review to formally acknowledge the rule’s failure and terminate the “no-otter” zone. This failure continued the threat of harm to the otters. In 2009, EDC filed a lawsuit challenging the FWS’ failure to act, and in late 2012 we celebrated a court victory and the termination of the “no-otter” zone. Sea otters were once again welcome in their native habitat with full protection under the Endangered Species Act. Unfortunately, the California Sea Urchin Commission and other fishing groups filed two lawsuits challenging the decision to terminate the “no-otter” zone. EDC represented The Otter Project, Los Angeles Waterkeeper, and our own members in the litigation in defense of the FWS and in an effort to ensure protections for sea otters. We prevailed in both cases at the District Court level, and ultimately in the Court of Appeals.